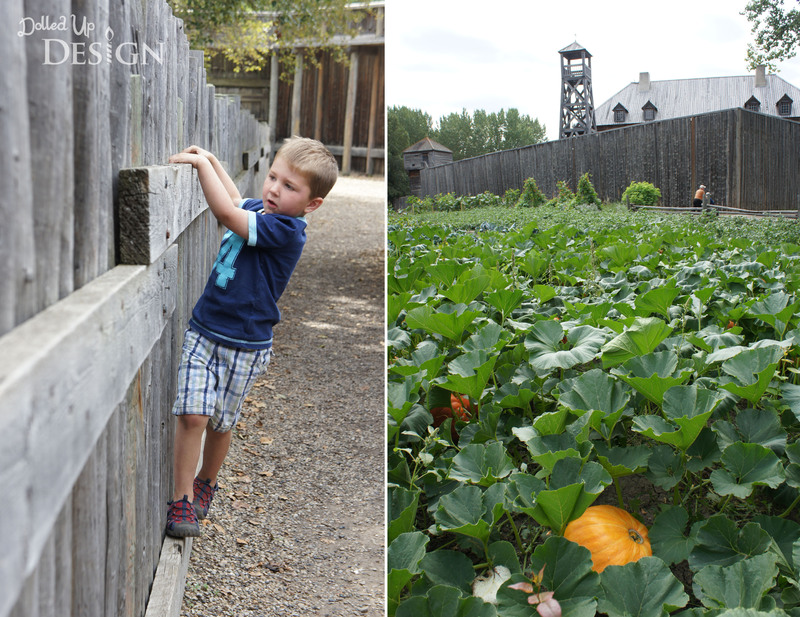 Visiting Fort Edmonton Park was one of the items on our Summer Bucket List. 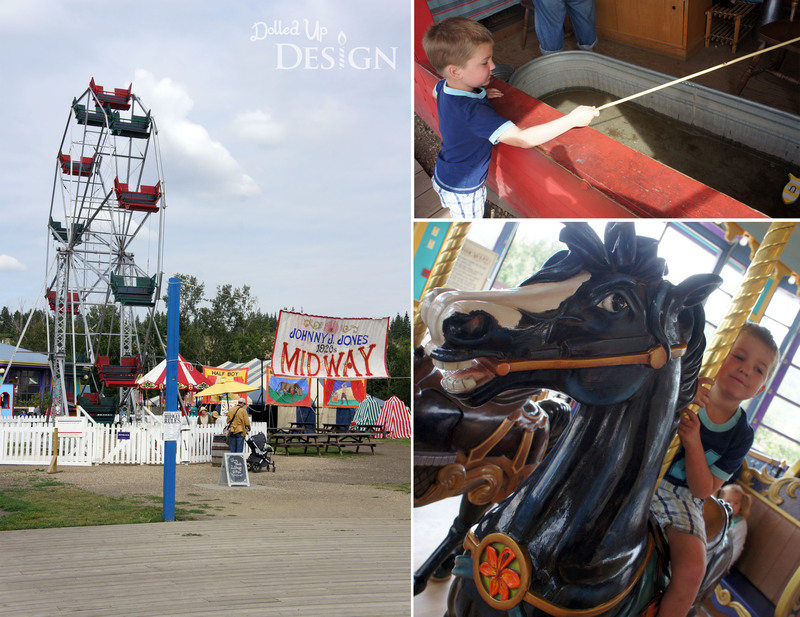 After taking the kids the past two summers, it has become a bit of an annual summer tradition now for us and is definitely something I now look forward to in the summer months. This year we made our way through the park travelling backwards through time. We began at the 1920’s midway, went down 1905 Street, stepped onto 1885 street and then made our way all the way back to the 1846 Hudson’s Bay Fort. 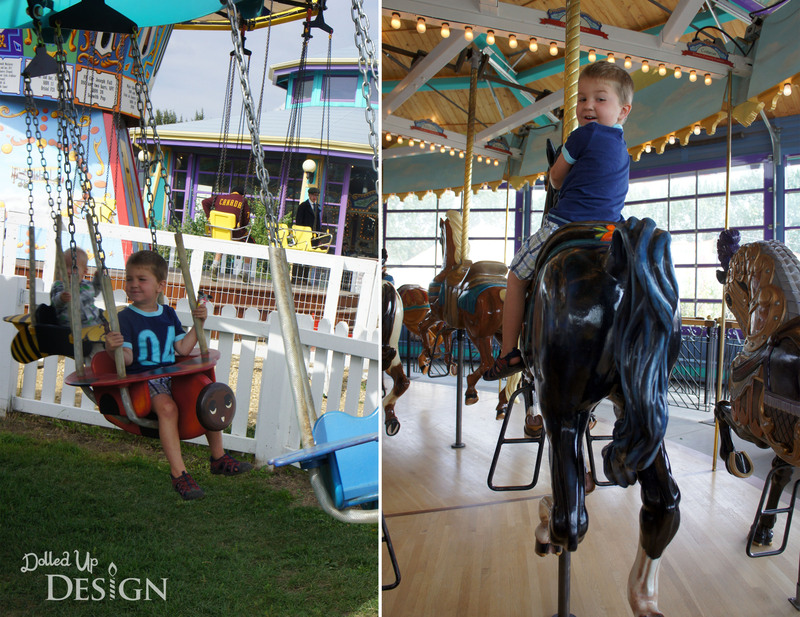 My kids are still a little small for some of the rides on the midway, but they were still happy to ride the beautifully restored carousel and go for a spin on the hand-cranked bug swing ride. Camden was also excited to try his hand at the fishing game again this year. For prizes, each kid came away with a plastic horse toy they proudly held onto for most of the day. 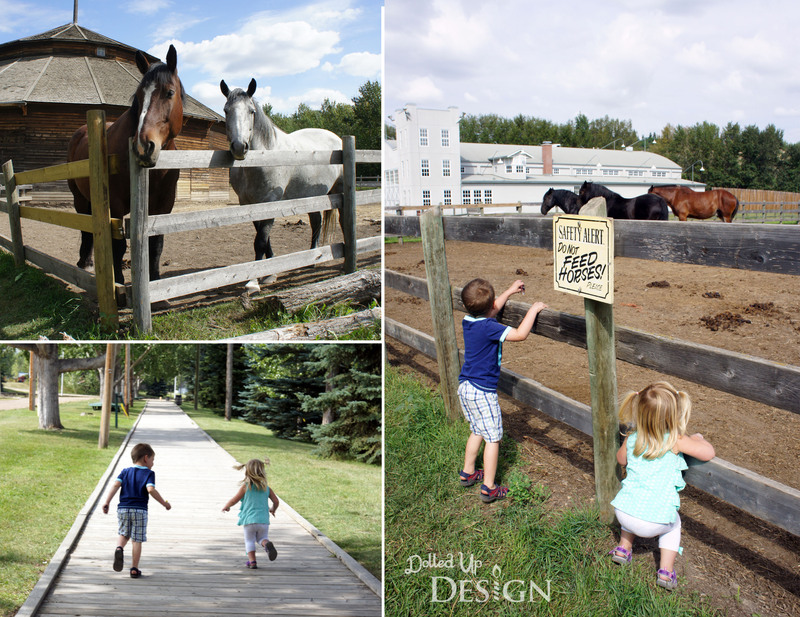 After enjoying the midway, we headed down the wooden walkways towards a farmstead where Keira happily discovered a pen of horses. This is just one of many animal pens throughout the park and seeing their excitement over the animals is a large part of the reason I love bringing the kids here. We then made our way through the firehouse and to the playground where the kids ran, climbed and worked off their ice cream cones. 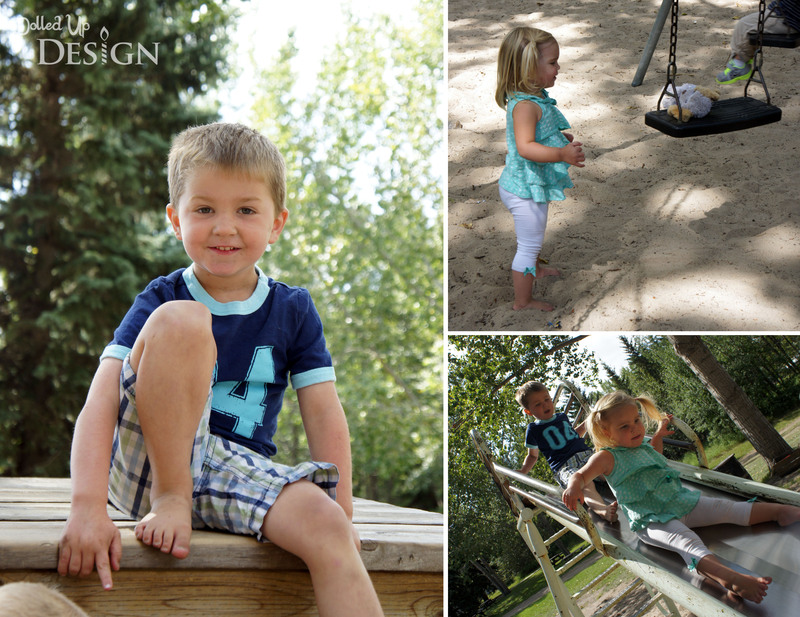 It is not a fancy playground by any means, but the swings, teeter-totters, slide and jungle gym are more then enough for the kids. I also love that it is tucked back away behind the buildings under a canopy of trees and is a nice spot to enjoy a packed lunch. Our next step back in time was past the tent city and teepee and onto 1885 street. While I was in University, I spent an entire summer baking cookies and working in the bakery on 1885. My attire included a long skirt, apron and a lovely bonnet while I spent the day in front of hot oven in the bakehouse. I was disappointed last year to see the bakery and bakehouse were no longer running and a new bakery area had been put in the hotel across the dirt street. Some things that haven’t changed are the horse drawn carriage ride running through 1885 street and the delicious hard candy’s from McDougall’s store. 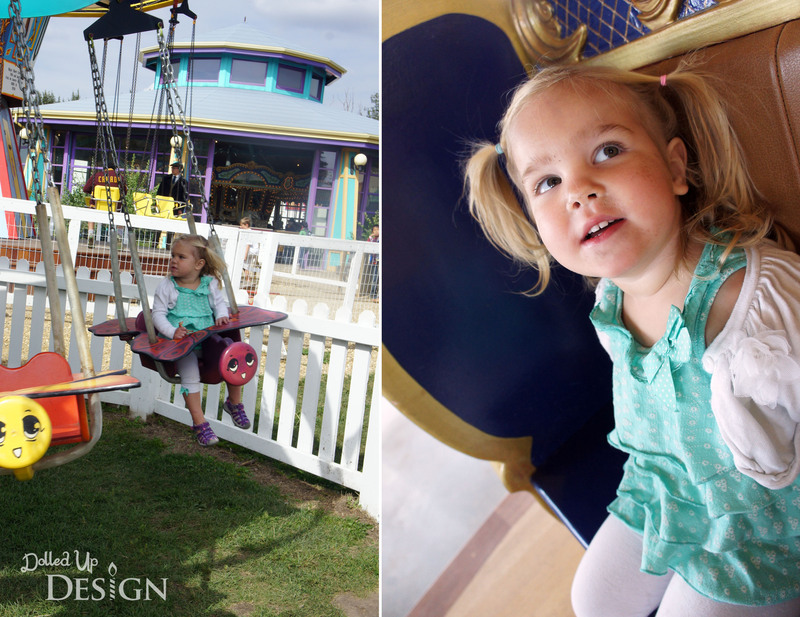 We enjoyed a bag of the raspberry flavor as we were waiting for our turn on the wagon ride! 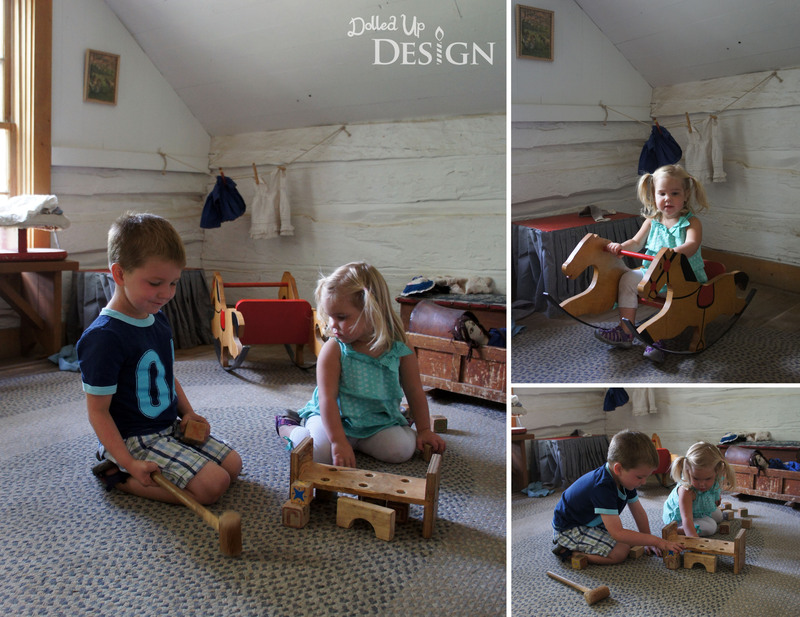 Even though there are all kinds of great old houses and buildings to look through, that day we didn’t actually view the inside of many of the buildings because the kids were too happy running around outside and finding animals. At the urging of one of the costumed interpreters I did end up getting them into one of the homes where they were excited to find a kids playroom upstairs. 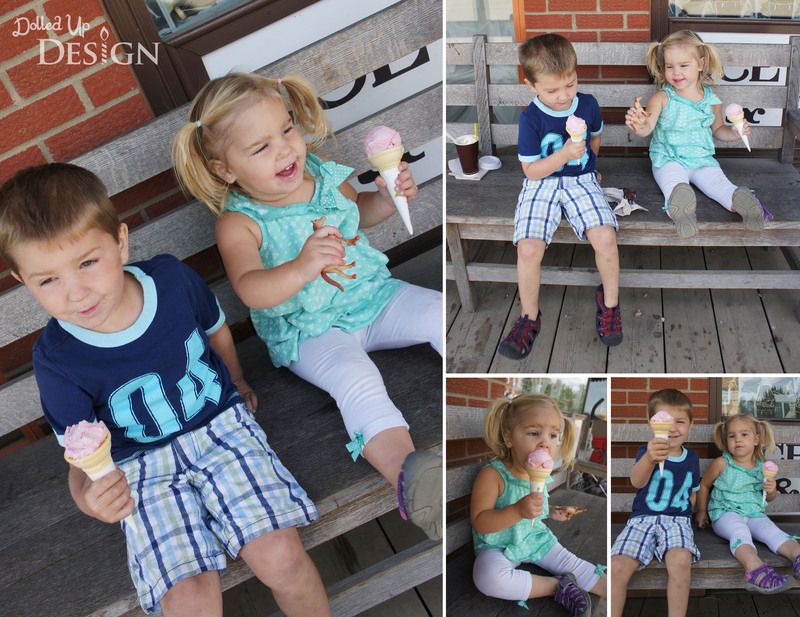 Before we went to Fort Edmonton, I tried to explain to Camden where we were going and showed him pictures from our past trips. He was quite excited by a picture from when he was 2 and he got to ride a pony so I promised he could ride one again this time. 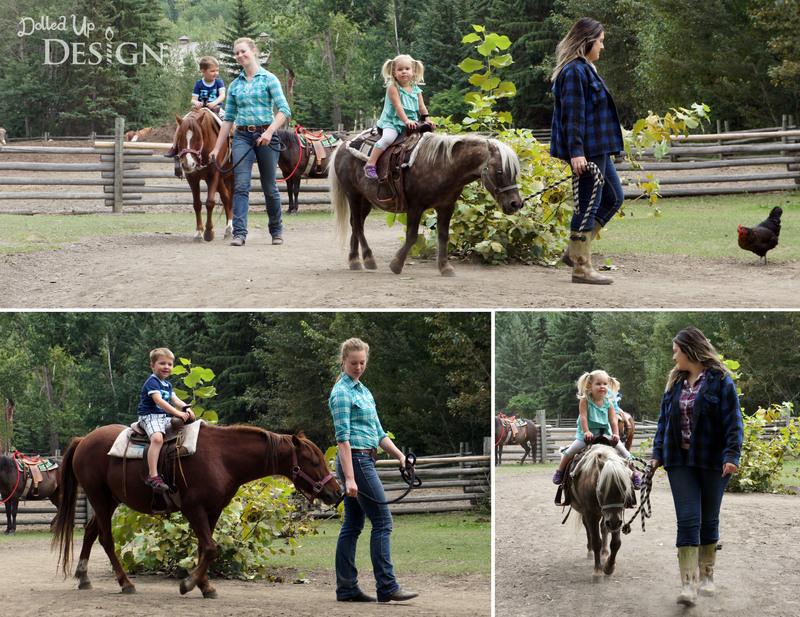 It was Keira’s first time riding and I think both kids really enjoyed the experience. Finally, we ended our trip through the park at the actual Fort. The kids were getting pretty tired by this point, so we didn’t do too much exploring but we did get a good glimpse into a few of the buildings to see what life used to be like for the early settlers here in Edmonton. We then wrapped up our day with a trip back to the main gates on the steam engine. 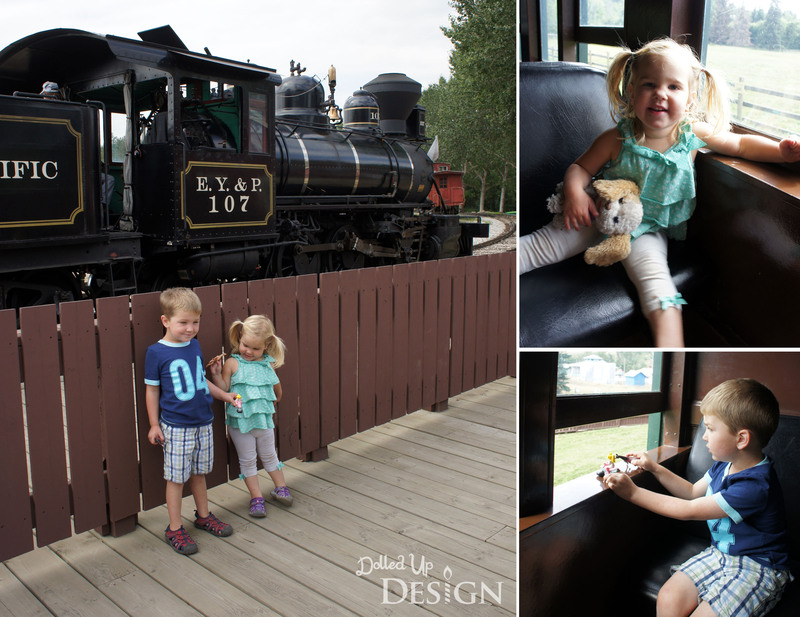 We had already gone on our train journey with Alberta Prairie Railway Excursions earlier this summer, but the kids were still very excited to get to ride a train. If there is a train involved, you can pretty much guarantee a successful outing with toddlers in tow! 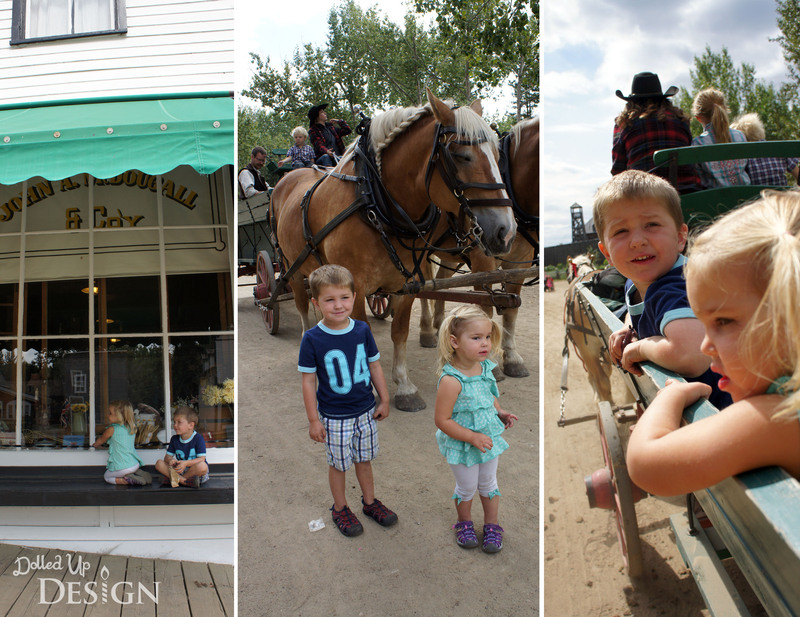 If you haven’t been to Fort Edmonton Park, I highly recommend it. This is my third year taking the kids and each year just seems to be getting better as they are able to do more and are learning more. It is fairly widespread so I brought the stroller along for my youngest, but we were able to make our through the entire park without using it too much. There are lots of areas to stop along the way and there is so much to see and do that I don’t think the kids really notice how much walking their little legs have done. And if you are an AMA member, don’t forget to show your card at the gate for 15% off admission!